Food in this place is excellent. The waiting time is minimum and the staff are fast they just don't speak much English. Very good food would highly recommend. We went here late at night just 10 minutes before they shut at 11pm, there were 11 of us all hungry and they were kind enough to let us in and serve us even though they were shutting. Then when we had finished it was raining really heavy so we called for taxis as we were staying about 20 minutes away and there were no taxis for another 30 minutes. They very kindly stayed open for us for a long time as we waited for the taxis. They were extremely nice people going out of there way to help us tourists who knew nothing of the area! 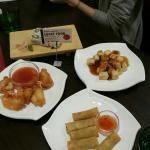 The food was very nice too and reasonably priced! We had a great time eating here. Been to Lucky Food? Share your experiences!